The Pharisees were an ancient and outstanding sect among the Jews known for their diligent observance of the outward matters of the Law. Although, according to the word of our Lord, they "did all their works to be seen of men" (Matt. 23:5), and were hypocrites (ibid. 23: 13, 14, 15, etc. ), because of the apparent holiness of their lives they were thought by all to be righteous, and separate from others, which is what the name Pharisee means. On the other hand, Publicans, collectors of the royal taxes, committed many injustices and extortions for filthy lucre's sake, and all held them to be sinners and unjust. It was therefore according to common opinion that the Lord Jesus in His parable signified a virtuous person by a Pharisee, and a sinner by a Publican, to teach His disciples the harm of pride and the profit of humble-mindedness. Since the chief weapon for virtue is humility, and the greatest hindrance to it is pride, the divine Fathers have set these three weeks before the Forty-day Fast as a preparation for the spiritual struggles of virtue. This present week they have called Harbinger, since it declares that the Fast is approaching; and they set humility as the foundation for all our spiritual labors by appointing that the parable of the Publican and the Pharisee be read today, even before the Fast begins, to teach, through the vaunting of the Pharisee, that the foul smoke of self-esteem and the stench of boasting drives away the grace of the Spirit, strips man of all his virtue, and casts him into the pits of Hades; and, through the repentance and contrite prayer of the Publican, that humility confers upon the sinner forgiveness of all his wicked deeds and raises him up to the greatest heights. All foods are allowed the week that follows this Sunday. Let us flee from the boasting of the Pharisee and learn through our own sighs of sorrow the humility of the Publican. Let us cry out to the Savior, "Have mercy on us, for through You alone are we reconciled." 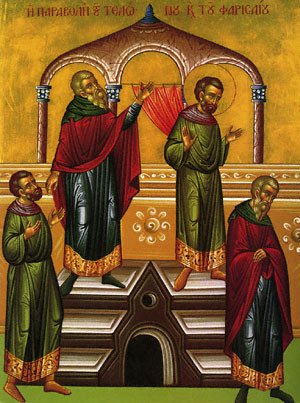 Share the feast of Sunday of the Publican and Pharisee: Triodion Begins Today with an icon greeting ecard.